blog.Habrador.com: Who was the man who knew infinity? Who was the man who knew infinity? This year there's a new movie out called "The man who knew infinity." It's based on a book with the same name written by Robert Kanigel. I haven't seen the movie so I can't tell the difference between them, but I've read the book, which you can find here for free because it's a few years old. So who was the man who knew infinity? The answer is an Indian by the name Ramanujan (1887-1920). He actually had just the name Ramanujan, but he would add the letter S before the name when signing letters. It was after sending one of these letters to the British mathematician Godfrey Harold Hardy, Ramanujan's life would forever change - both for the better and worse. Ramanujan had earlier sent letters to other British mathematicians, but Hardy, who was ten years older than Ramanujan, was the only one who replied with at least a slightly positive answer. 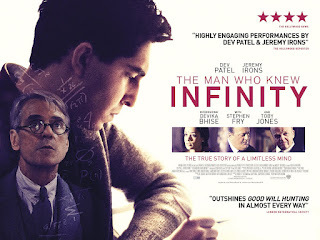 So they began to exchange letters until Hardy realized that Ramanujan was something special. Hardy was so blown away by Ramanujan's mathematical accomplishments he did everything he could to bring Ramanujan to England. In fact, Hardy, who was one of the most distinguished mathematicians at the time, said his greatest discovery was not an equation, but finding Ramanujan himself. As Hardy was a large part of Ramanujan's life, the book is also a biography about him. Several theorems of Ramanujan are now being widely used in subjects like particle physics, statistical mechanics, computer science, cryptology and space travel in the United States - subjects unheard of during Ramanujan's time. He was unlucky to be born in a poor family, but he was lucky to be born in the correct caste: Brahmin. In India, they had (and still have to some extent) a caste system where you are born into a social class. Ramanujan was lucky enough to be part of a caste which encouraged learning and where the members could become something and were not destined to work with manual labor. He was lucky to be invited to England, but unlucky to be invited at the time of the First World War. This resulted in that most mathematicians were sent to the front, and the ties with the mathematicians in mainland Europe, like Germany, were cut off. So even though the plan was that Ramanujan would spread his knowledge across Europe, and find ideas from other Europeans, he was in the end connected to just a few British mathematicians. "He would probably have been a greater mathematician if he had been caught and tamed a little in his youth; he would have discovered more that was new, and that, no doubt, of greater importance. On the other hand he would have been less of Ramanujan, and more of a European professor, and the loss might have been greater than the gain." Ramanujan was clearly a very bright man, but he wasn't a "rain man" - he had friends and he could take care of himself. So how could someone without any education accomplish so much? First of all, Ramanujan dedicated his life to math. He was so devoted to math that he couldn't bother to study the other subjects he needed to earn a college degree, so he was almost not allowed to study math in England. While in England, he was known to work for 30 hours and then sleep for 20 hours. Secondly, Ramanujan never cared about proving his findings. This was a problem. When he had moved to England he was forced to prove his findings or he wouldn't be published and thus fail to achieve any sort of recognition. But as he never cared about proofs, he could produce more math, because proving math is really difficult. One good example is Fermat's Last Theorem, published in 1637. It took no less than 358 years to prove that theorem, and the guy who finally put the last pieces together had to dedicate seven years of his life to the proof. In the end it turned out that less than one third of Ramanujan's findings turned out to be incorrect. Ramanujan's belief in Hindu gods, it stands repeating, did not explain his mathematical genius. But his openness to supernatural influences hinted at a mind endowed with slippery, flexible, and elastic notions of cause and effects that left him receptive to what those equipped with more purely logical gifts could not see; that found union in what others saw as unrelated; that embraced before prematurely dismissing. His was a mind, perhaps, whose critical faculty was weak compared to its creative and synthetical. It is the critical faculty, of course, that keeps most people safe - keeps them from rashly embracing foolishness and falsehood. In Ramanujan, it had never developed quite as fully as the creative - thus giving him the credulousness, the appealing innocence, upon which all who knew him unfailingly remarked. Without the protective screen, as it were, he risked falling prey to the silly and the false - as many over the years, would view his belief in palmistry, astrology, and all the rest of the esoterica to which he subscribed. And yet, without that screen did he thus remain more open to the mathematical Light? Ramanujan's religious belief would in the end cost him his life. His religion forced him to be a vegetarian. When he got sick in tuberculosis, he still refused to eat any other food than Indian-vegetarian, which was difficult to find as there was a war going on and the British chefs couldn't prepare Indian food. He had once eaten non-vegetarian food (by mistake) and he believed it almost cost him his life as his god has punished him when German zeppelins bombed the area around his house just after he had eaten the non-vegetarian food. It's believed that it was the tuberculosis and a severe vitamin deficiency that would kill him at an age of just 32. Are the many smarter than the few?